The 11th OPEN ART EXHIBITION at the Grosvenor Museum, Chester, ran from 12 March to 17 June 2015. One of the exhibits, by Stuckist artist John Bourne, is illustrated above. 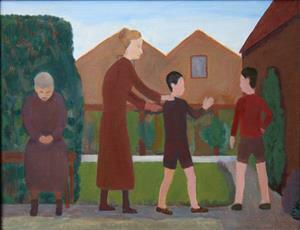 The painting was inspired by childhood visits to two elderly aunts in Bangor, N. Ireland. The 194 exhibited works are displayed salon-style, covering the walls. This is the format favoured by the Stuckists.